1880 Football first officially played in NSW (Wanderers Vs Kings School) - organised by John Walter Fletcher. The first recorded soccer match in Australia was played on Parramatta Common in Sydney on the afternoon of Saturday 14 August 1880. Students from The King's School First XV rugby squad made up one team. The other, probably dressed in blue stockings, knickers that billowed beneath the knee and white jerseys that sported a southern cross over the left breast, was to become The Wanderers, the first 'Association Football' club in the land. Fletcher had been elected Honorary Secretary of the committee set up to form an 'Association Rules' football club on 3 August 1880. On behalf of the committee he had then arranged the first match and on 19 August he presented the committee's proposals to a meeting of faithful for the official establishment of 'The Wanderers' Football Club. Thereafter Fletcher continued as Secretary, enrolling the new club with the (English) Football Association, organising more games and opponents, and in 1881 forming a team at his own Coreen College. 1881 soccer starts in Melbourne with four clubs formed. 1882 NSW English Football Association established. 1883 First interstate match Victoria vs NSW Affiliation granted with British FA. Queensland's first club the Rangers, formed. 1884 Competition between three clubs in Brisbane, Anglo-Queensland Football association formed. Meeting held at Young and Jacksons Hotel in Melbourne, where the Anglo-Australian Football Association is formed. 'A meeting of gentlemen favourable to the formation of a football club under the British Football Association rules was held at Young and Jacksons Hotel on Friday night. Over 30 gentlemen were present. Mr W Niven occupied the chair and stated the object of the meeting. In order to test whether the game would be popular or not here, it would be best to form a club. On the motion of C Kier, seconded by Mr F Lowe, it was decided that a club be formed to play under the British Association rules. It was resolved that the club be called the Anglo-Australian'. The following gentlemen were elected as temporary office bearers - Captain, C Kier, vice-captain F Lowe, secretary and treasurer JC Teare and committee, Messrs Smith, Buchanan, Niven, Brough and Keef'. 'A member of the Melbourne Prahran club, Arthur Gibbs arrived from the United Kingdom in 1884 and immediately founded Victoria's Anglo-Australian Football Association. He was the foundation secretary of the Association until 1887, and captained Victoria in the inter-colonial series against New South Wales from 1884 to 1886. Gibbs was also the co-founder of soccer in New Zealand when he was transferred there by his insurance company in 1890. In 1901, Gibbs visited London in an attempt to get a British team to tour and finally retired in London in 1909. Gibbs was the Australian representative on the English FA council between 1910 and 1928, and paid Australia's yearly contribution to the FA from 1886 to 1923 when the Australian Soccer Association was founded. 1885 First competition series, the 'badge' competition, and knockout cup worn by Granville, Sydney. 1886 First request by Australian officials for a visit by an English team. 1890 Queensland visit Sydney for two interstate matches. Carlton play South Melbourne in the final of the Beaney Cup Carlton have now held the Beaney Cup for 3 successive years, and the George and George Cup for a like period. Although the South were again defeated, if they only stick together they ought to be at the top of the tree next season. 1891 Goal nets used for the first time at Wentworth park. 1893 Premiership of four clubs inaugurated on the South Coast / Illawarra of NSW. 1895 James Jackson - from Newcastle, NSW joins Glasgow Rangers - then Arsenal Woolwich, Newcastle United and Abercorn. James Jackson (September 15, 1875 - date unknown) was a Scottish footballer. Jackson was born in Cambuslang, Lanarkshire, but his family emigrated to Australia when he was two. The young Jackson grew up in Australia and played football as a youth, before returning to his homeland in 1893. He first played for junior side Newton Thistle, and then signed for Rangers in 1894, although he was only a fringe player at the club. He was sold to Newcastle United in August 1897, and played for the Magpies for two seasons, helping them to promotion to the First Division in 1897-98. In 1899 he joined Woolwich Arsenal. He made his debut against Leicester Fosse on September 2, 1899, and for the next six seasons he was a regular at the club, playing either at left back or wing half (i.e. on one side of midfield). He was a virtual ever-present in the Gunners' 1903-04 promotion-winning season, and was captain of the club in its inaugural First Division season. In all he played 204 matches for Arsenal, scoring one goal. Jackson left Arsenal in 1905 to become player-manager at Leyton (who had just been promoted to the Southern League), but his spell was short-lived and later that year he signed for West Ham United, before rejoining his old club Rangers in 1906. He retired to become a blacksmith, although he briefly came out of retirement to play for Morton in 1911. James Jackson was not the only sporting member of his family. His son, James Jackson, Jr. was a successful footballer himself, playing over 200 games for Liverpool, and later becoming an ordained priest after retiring from football. His nephew Archie Jackson was an Australian test cricketer. The first time nets were used in NSW was in 1895 when the Balmain and Thistle clubs played on Birchgrove Oval.24 It took till 1898 and the Denton (Northern knock-out) Cup final for their first appearance in Newcastle. Participating teams were West Wallsend and the Minmi Rangers, and the venue was Newcastle Cricket Ground. 1896 First official administration begins in Western Australia. 1902 Competition begins in SA - three clubs Woodville, North Adelaide, South Adelaide. 1904 NSW sends team to tour New Zealand, the first team to travel outside Australia. plays nine matches for five wins, two draws and two losses. 1905 First visit by an overseas team - New Zealand - games in eastern states. 1906 100 Clubs registered in NSW. 1908 Western Australia tour South Australia, NSW and Victoria. Victorian Amateur Soccer Football Association formed. 1909 Victorian competition re-organised. Dockerty Cup begins. 1912 Senior Sydney clubs adopt numbering of players- a world first. 1913 Interstate game between NSW and Victoria reinstated after 25 years. 1914 Plans to form Australian Soccer Association scuttled by WW1. 1916 Over 1000 recognised football players serving in the AIF. 1917 First AIF teams plays in France. James (Judy) Masters (1898-1955) was born in Balgownie, Southern NSW, into a football family and captained his school team at the age of 12. He joined Balgownie in 1901 and was selected for the senior team at the age of 15 in 1904. Masters went on to captain Balgownie, South Coast, NSW and Australia, playing 22 times for the national team, including 13 full Internationals, scoring 12 goals and captaining from 1923 to 1925. Know as the 'Little Master', he was recognised in his centre forward role as one of Australia's best players before and during his time. He joined the Army in World War One and led an AIF team which was formed in France when peace came in 1918. During his career, Masters was never cautioned by a referee in more than 400 club and representative games. 1919 Returned servicemen boost ranks - ASA back on the agenda. 1921 An Australian Soccer association is formed with its head quarters in Sydney. 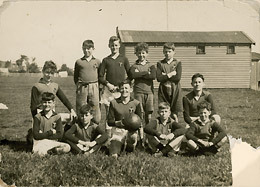 1922 Australian national team played their first games as they toured New Zealand . The team played 14 matches with nine wins. 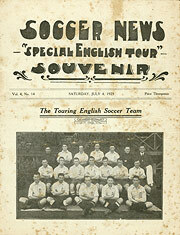 Soccer program: a souvenir of an English tour in 1925. A crowd of 49 500 watched Australia lose this match at Sydney Showground. International tours were popular in the 1920s, particularly in NSW. 1923 New Zealand tours NSW and Queensland to play 15 matches followed by the first visit of a Chinese team from Hong Kong. 1924 Canada tours Australia to play six Tests with two wins, one draw and three losses. 1925 First recorded publicity of women's football in Australia.' Reds v Blues, Brisbane. A strong English team tours Australia. The squad played 26 matches, including five Tests and wins all 26 games. 1927 Major dispute in NSW over sham-amateurism of State Officials. 1928 Australia makes a 23 match tour (17 wins) of Dutch East Indies. 1931 Tour of Dutch East Indies (13 matches). 1932 NSW State league granted affiliation with Australian Soccer Association, after a break of 4 years. NSW hosts All-Australian State Carnival in Sydney. 5 States compete won by NSW. 1933 Australian team tours New Caledonia for three tests. 1934 First paid secretary and a central office established in Sydney. 1937 Chapman's legacy was finally revealed to Australians on the 1937 tour by an English Amateur XI. Although Australia registered an historic series win, local officials began to take notice of the need for qualified coaching personnel. 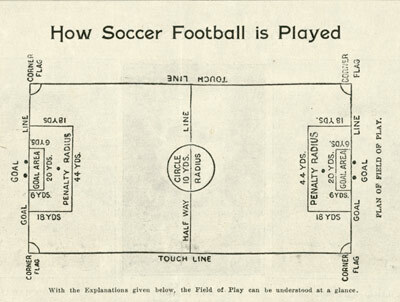 1937 Numbering of shirts from 1-11 adopted by all states, followed by England. 1938 India tours Australia, many of its members play in bare feet. Five tests, one win, one draw, losing three. 1939 The Gladesville-Ryde club appointed the first professional soccer coach in Australia, Bobby Walker, who had played professionally for Scotland's Motherwell FC and Falkirk FC and had attended FA coaching courses before becoming player-coach at the Hibernians club in Malta. A strong England Amateur team tours Australia, beaten 2-1 in tests. 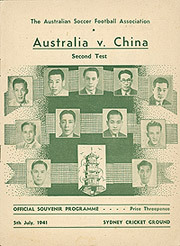 Soccer program: from the Australia versus China Second Test in 1941. A Chinese team toured Australia and played a series of five matches against the Australian national side. 1943 Breakaway meeting at Newcastle. 1945 Soccer company formed to control first division matches in NSW. 1947 South Africa tours Australia. ABC broadcasts the NSW State Cup final for the first time. 1949 Hadjuk tours Australia. Australian Joe Marston joins Preston North End in England. 1950 Australia tours South Africa without great goal scorer Reg Date. A second string Australian side travels to New Caledonia. 1952 White ball used for the first time in Australia. 1954 Joe Marston (Preston North England) becomes the first Australian to play in the FA cup final. Former English amateur Vivian Chalwin appointed coach of Australia. 1955 Ampol Night Series begins in Melbourne. 1956 Olympic Games held in Melbourne. National team defeats Japan 2-0 and then losses to India 2-4. Australian referee Ron Wright, is chosen to officiate in the Soccer final. 1957 In January, a group of dissatisfied officials and players met at the home of Hakoah official Walter Steinberg. There had been growing discontent amongst NSW migrant clubs with the way in which the NSW Association ignored the promotion issue, the style of leadership of some of the officials of the amateur association and perceptions that they were discriminated against on the part of migrant clubs and their memberships. A rebel administration was set up and a new competition formed. It was called the NSW Federation of Soccer Clubs. The Federation and the Association were to be at loggerheads for several years. 1958 Blackpool, with the legendary Stanley Matthews, tours Australia. NSW Soccer Coaches Federation founded. 1960 Australian Soccer Football Association suspended by FIFA. Poaching of players from overseas.......Australia suspended by FIFA. 1961 Visiting NSW Federation officials led by Dr Henry Seamonds meet with their counterparts in Victoria and South Australia. There were two items on the agenda - the creation of a national knockout cup, and the formation of the Australian Soccer Federation. Soon after, a Victorian deputation consisting of Theo Marmaras of South Melbourne Hellas, Fred Hutchison of Wilhelmina and Michael Weinstein and Stuart Beaton of the Association met with officials from WA, SA, QLD and NSW. The Australian Soccer Federation was formed with Henry Seamonds made Chairman. 1962 Victorian Soccer Federation formed. Australia Cup begins and an Interstate Carnival takes place. 1963 FIFA refused to readmit Australia until fines of £48 000 were paid. Gradually, relations improved and FIFA dropped its demand to £30 000. In February, Henry Seamonds - Chairman of the ASF died in Melbourne after suffering a heart attack during the lunchtime adjournment of a particularly heated soccer meeting on the issue of the readmission of Australia to FIFA. At the ASF Annual Meeting in March, a vote was taken to return to FIFA. Then in early April, the Federation agreed to send a £5000 bond to FIFA and ASFA handed over its operations to the Australian Soccer Federation in Sydney. 1964 Asian Football Confederation denies Australia and New Zealand membership. 1965 For the first time Australia enters the World Cup but is soundly beaten by North Korea. 1966 Oceania Football Federation founded. 1967 Australia won 'Friendly nations' competition in South East Asia. 1968 Australian Amateur Association formed. 1969 Three test series against Greece. 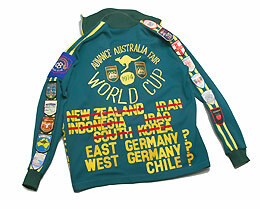 Socceroo mascot suit: Jim Scane, now 90, was the Socceroo’s major fan in Germany in 1974. He went to all the matches and covered his green and gold suit with the names of the Australian squad --- and most of the opponents. Whenever Australia beat a team, Jim put a big red mark across the name. 1970 Australian team takes overseas tour - three continents to Iran Israel, Greece and Mexico. 1971 Name the Socceroos adopted for the Australian men's team Scotland and Manchester United tour Australia. 1972 Australia resigns from OFC to pursue membership with the Asian Football Confederation. Futsal introduced into Australia. 1973 Australia begins competing in the World Cup (South Pacific zone) elimination series. It wins. 1974 Australia gains entry to the World Cup finals held in Germany. In the group phase, Australia lost to West Germany and East Germany, and drew 0-0 against Chile. Formation of the Australian Women's Soccer Association. 1977 The Philips Soccer League kicks off in Australia - the country's first national sporting league - with 14 teams. 1978 Australian women's team enters its first international event, the first Women's Invitational Tournament, Taiwan. Australia rejoins the OFC. 1981 Australia hosts FIFA under 20 World Youth Cup. 1984 Two Conference system introduced for the National League. The Australian Conference was made up entirely of NSW based teams, whilst the National Conference was made up of teams from Victoria, Queensland and South Australia. 1985 Five Australian players based overseas. 1987 The National League reverts back to a 'one conference' setup. Former powerhouse club, Sydney City withdraws from the league, after one round, due to lack of funding. 1989 The number of Australian players based overseas hits 23. Australia futsal team plays in the first Futsal World Championship. 1991 First World Cup semi final appearance of Australian under 20 team. 1992 Top 6 introduced into National League finals. 1993 World Youth Championship held in Australia. 1995 Australia participate in the Women's World Cup for the first time. Soccer Australia replaces the Australian Soccer Federation. Australian football internet presence began - with the creation of the ozfootball website - at the same time both the Newcastle Breakers and South Melbourne football clubs began fledgling websites. 1996 Women's National Soccer League (WNSL) formed - Qld Academy of Sport inaugural WNSL Champion. 1997 Australia establishes a world record for most consecutive wins in 'A' internationals (14). Australia competes in its first FIFA Confederation Cup- reaches the final against Brazil. 1999 Largest crowd for an Australian club match - 88,101 at Australia v World Stars, Sydney. Australian under 17 team reaches final of the World Cup -Australia's first appearance in a World Cup final. 2003 Australian Football Federation formed. 2004 NSL closes down with its deciding match of the 2003-4 season Perth Glory 1 vs Parramatta Power 0 on April 4. 2005 Australian Soccer Association changes its name to Football Federation Australia. A new national competition the A-League begins with eight teams begins on August 26. Sydney wins grand final In November, Australia defeats Uruguay, over two-legs to reach the World Cup finals for the first time in 32 years. 2006 Australia officially joins the Asian Football Federation. Australia plays Greece in Melbourne.